Add the beauty of trees to your landscaping in a fun new way with this Panacea Black Forged Twig and Leaf Trellis Package. The slightly twisted rods and metal leaf accents throughout each of these three trellises evoke trees, bringing a cohesive and lovely look to your garden with ease. The single, 23.25" wide unit creates a fantastic garden centerpiece, and its intersecting metal rods form a grid to easily support your climbing plants. 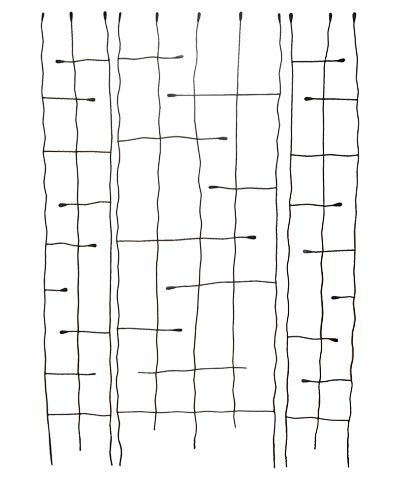 Use the two included, 10" wide trellises as side panels to make a lovely screen, or to cleverly divide your garden. The matching rods and leaf shapes on each trellis enhance your foliage, while the metal construction lasts for many seasons. The black color of each item offers a classic hint, and the two legs on each insert into soil for a straightforward installation. Each unit is hand forged for a truly unique accent, and is perfect for displaying in a wealth of outdoor locations. Bring a sylvan hint to your yard and support a few climbing plants with this Black Forged Twig and Leaf Trellis Package.